If you’re looking for the perfect bridal look, something that highlights your natural beauty rather than turning you into a template bride, you’ve come to the right place. Wedding bells seem to be going off everywhere I turn. A very dear friend of mine is getting married soon, and while I was busy hunting for the perfect bridal look for her, I was asked to write this article. So I jumped in with a lot of enthusiasm, spending a lot more hours than were necessary, to come up with the best Hindu bridal makeup tutorial I could. I looked, and looked, and looked. It was the same thing everywhere – couture looks that would not do well off the ramp. Then all of a sudden I remembered where I’d seen a look that a bride could even do herself. Another friend of mine had tied the knot recently, and I have to say, I’ve seen few Bengali brides look as radiant as she did on her wedding day. And I’ve been to my fair share of weddings. So today, I’m going to tell you exactly how to pull-off this Hindu bride makeup look perfectly. Read on. The basics of make-up still remain the same. Use a cleansing cream or make-up remover to clean your face and neck. Splash your face with chilled water and pat dry. Use a concealer to hide any dark circles or breakouts you’ve acquired thanks to the stress of being involved in the Big Fat Indian Wedding. Then apply the primer. Don’t skip this. Your foundation needs something to hold on to for the six odd hours under harsh lights and near a big, hot fire. Now apply the foundation. Needless to say, you need the waterproof, sweat proof (and tension-proof if you can find it) variety. Also, it’s better to choose the kind that comes as a mousse. Why? Because you’ve got more make-up coming up and you don’t want to look like a ceramic doll. Next, use a compact or loose powder to help the foundation set perfectly. Apply it with a fluffy blush brush to ensure you get maximum coverage with the least possible heaviness. The picture above was taken after the concealer, the primer and the foundation were applied. It also captures the exact moment when the false eyelashes were about to be applied. 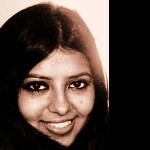 Quick Tip: If you’re a dusky beauty, embrace it. Don’t even think about trying to use a lighter shade of foundation or compact in an effort to look fairer. Well meaning yet annoying female relatives will often ask you to do this. Refuse with a smile. You’re the bride. Nobody’s going to look better than you are. You can move on to the blush now. Depending on how dark you’d like your lips to be, go with a deep blush or a light dusting of bronzing powder to highlight your cheekbones. Just do yourself a favor and stay away from the dark blush-dark eye-dark lip combination. For the Bengali bride, the forehead decoration is a must. I’d suggest that you get a professional or an artist in the family to help out. You don’t want this getting messy and ruining the make-up you’ve done so far. Now comes the all important eye make-up. This is your day, so make your eyes as dramatic as you can handle. False eyelashes are necessary here. Read the tutorial on how to apply falsies. Apply the three eye shadow shades and blend to even out the harsh edges. Apply waterproof kohl on your lower lash line. Apply the eyeliner after attaching the false eyelashes. To get perfect look, follow the instructions in the tutorial – applying bridal eye makeup. In the picture above, you can see that the eye and cheek make-up and forehead decoration are done. All that’s left is the lipstick and the grooming of the eyebrows. Remove any strays and then fill in your eyebrows. Use a brow brush to shape them perfectly. The last step is here. Use a lip liner to outline your lips. Fill in with the lipstick shade of your choice. Wait for a minute and then re-apply the lipstick. Finally, if you like the glossy look, swipe on some lip gloss, and you’re all set for compliments. 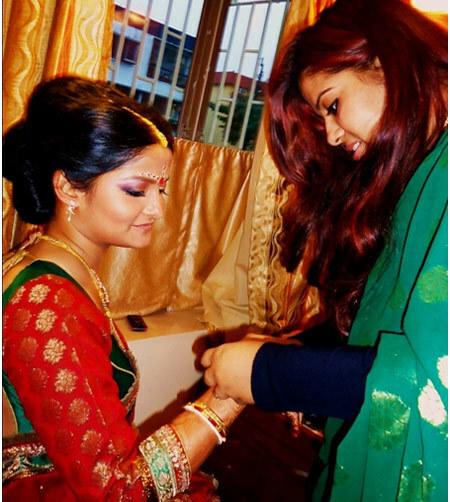 In the picture above, you can see that the bridal make up is almost done. Yes, that’s me, helping the bride with her jewellery. Keep your lip make-up for the last possible minute if you want the perfect pout to stay perfect. Doesn’t she make a lovely bride? Here, her less-is-more make-up works perfectly. Now, I’m not being biased, I promise. Let me explain how. For starters, the make-up highlights the bride’s best features and doesn’t make her look unnatural. Secondly, and this is very important, it does not compete for attention with her wedding outfit or her wedding jewellery. Rather it complements them both. 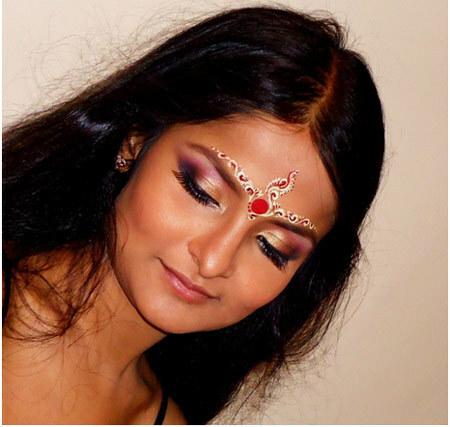 Thirdly, the sandalwood paste design on her forehead doesn’t overpower the entire look. Traditionally, the sandalwood design is applied on the cheeks too but believe me, you wouldn’t want be unrecognizable on your own wedding and neither would you want to be seated in front of a raging fire with sandalwood threatening to drip down your cheeks. You’re much better off with a light dusting of bronzing powder or blush. Also See 29 Stunning Pictures Of Indian Brides. So, did you like this tutorial with a twist? A real bride with real make-up and not just some model posing as a bride. Would you try this look or would you do something different? If you would want to change something, what would it be? Don’t forget to let me know. Also, if you’re looking for the perfect bridal look and can’t decide on one, drop me a line, and we’ll figure it out together.